Over the past several months, Metro staff and the Metro Board have been considering an operations plan for the Crenshaw/LAX Line and Green Line that would go in effect after the Crenshaw/LAX Line opens, which is forecast for mid-2020. Looking east down the Green Line tracks toward Aviation/LAX Station. 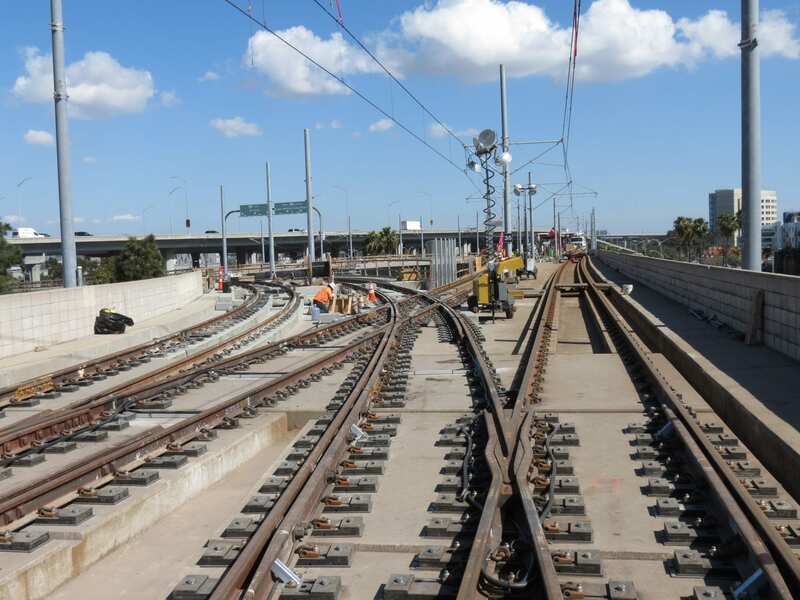 The tracks turning to the left lead to the new Crenshaw/LAX Line. Photo: LA Metro. As part of the Crenshaw/LAX Line project, the tracks were joined in a three-way junction with the Green Line just west of the Green Line’s Aviation/LAX Station — see the pic at right. The junction will allow trains to move between the two lines, meaning Metro needs to develop an operating plan for both lines. •Plan C-1 in which one set of trains would run between Norwalk and the new Expo/Crenshaw Station being built as part of the Crenshaw/LAX Line. Another set of trains would run between Redondo Beach and the new Aviation/Century station, which would be the transfer point between the two lines. Metro staff recommend this option, saying it would best serve current and future ridership patterns, allow for direct service to LAX from all three directions (Redondo, Norwalk and Expo/Crenshaw) and allow for direct special event service to the new Downtown Inglewood Station for games/events at the new NFL Stadium and adjacent entertainment district. The C-1 Plan, however, would require a transfer at the new Aviation/Century Station for those riding between the four westernmost stations on the Green Line and the rest of the existing Green Line. The transfer would add about seven minutes to rides. Two items worth nothing: The Green Line will eventually be extended to Torrance as part of a Measure R- and M-funded project. Also, trains would eventually run between Redondo Beach and the new Airport Metro Connector station to be built at Aviation and 96th Street — where riders will be able to transfer to the future LAX people mover. •Plan C-3 in which one set of trains would run between Redondo Beach and Willowbrook/Rosa Parks Station. Another set of trains would run between Norwalk Station and the new Expo/Crenshaw Station. A motion — see below — signed by six members of the Metro Board back trying the C-3 plan for one year after the Crenshaw/LAX Line opens, citing the need to preserve direct rides between Redondo Beach Station and the eastern side of the Green Line. The motion was approved by a 3 to 2 vote in the Board’s Operations, Safety and Customer Experience Committee earlier this month. The motion requires seven votes to pass the full Board. The presentation at the top of this post explains many of the issues involved. One that was fleshed out more at Committee that I think bears repeating: due to the age and limitations of the Green Line traction power system that delivers electricity to trains, in plan C-3 Metro would only be able to operate two-car trains on both lines. Bottom line: if Metro wanted to run service every six minutes on both lines, then trains along the new Crenshaw/LAX Line would be limited to two cars. Even though the project was built to accommodate three-car trains. Staff point out that two-car trains could lead to more crowding, which is less than ideal for a new rail line. The Metro Board meeting is scheduled for 9:30 a.m. on Thursday, Dec. 6. As usual, it will be livestreamed. It’s also worth mentioning that the L.A. Times recently published a good story about the plan. How does Metro plan to accommodate 3-car trains at the existing Aviation Station considering that it currently only fits 2 cars? Will the platform be extended or will riders needing to exit be expected to sit in the first two cars? I believe ll platforms are long enough to handle 3 car trains. It’s the power substations that can’t accommodate the three car trains. I know Aviation Station can only handle 2-car trains. I think the same is for Mariposa to Redondo Beach. So i don’t understand the 3-car v 2-car issue. It seems like they can only run 2 cars no matter what line we are speaking about. That’s not correct. The freeway stations can all platform 3 cars but Aviation station can only platform two cars. If metro is intending to run 3-car Crenshaw trains, they will need to: extend the platform, abandon the station, or open doors on only two of the three cars. You can clearly see that only two cars fit in this video. Yes, you’re correct that Aviation Station is a two-car platform at this time and would need to be extended to handle three-car trains. C-1 all the way. The Board is crazy for pushing C-3. Noting that Crenshaw will not yet connect to the people mover, and require a bus connection, is anyone expecting crowding on the Crenshaw Line? Note that the Blue Line and Gold Line operated with two cars for several years after opening. Ten trains an hour on the Crenshaw corridor is much more than the Gold Line received when it first opened from Pasadena to Union Station. I think that, once the people mover is opened, switching to C-1 would be fine, but the El Segundo area has many jobs which existing Green Line riders need to get to. So why not just upgrade the Green Line’s power substations so that they can accommodate 3 car trains? Why not upgrade the existing Green Line to accommodate 3 car trains. Alternatively, the Green Line from Redondo Station should go up to Expo/Crenshaw Station so the South Bay passengers have more reason to go to DTLA instead of Norwalk. This gives LAX passengers more train capacity especially during rush hour. This should be presented as the C-1.5 Option. Plan C-1 makes more sense. The WYE junction should really have been built with a flyover, to allow more movements per hour. That should be a requisite for the Green line southern extension. It is already elevated. If you mean like how a junction is arranged in Rotterdam, that would invole moving the I-105 which is impossible. C1 & C3 makes no sense at all. Instead, It should be similar to The Red/Purple Line operations. MTA should have all trains begin and end at Norwalk station. However every other train shall go to Redondo Beach, and every other train shall go to LAX/Crenshaw. The 6 minute frequency between Norwalk and Aviation Blvd would be maintained during rush hours…between LAX and Crenshaw would be 12 minutes and Redondo Bch would be 12 minutes. It looks like C1 is preferable on most counts; its main drawback is the need to transfer from Redondo to Norwalk at Aviation/Century, which adds 7 minutes due to backtracking. Having transferred many times between Blue and Expo at Pico, I agree that this kind of backtracking is a serious annoyance. There are two options that appear to be a fairly simple remedy, but I haven’t seen them discussed at all. 1. Run the stub line to Aviation/Imperial instead of Aviation/Century. This has all the advantages of C1, and additionally it (a) removes the backtracking on transfers from the stub to Norwalk, (b) adds a negligible burden on transfers north of Century, (c) really only impacts people traveling between Redondo and Century station, who now need to transfer, but this is countered by (d) allows travel between Redondo and Imperial station without a transfer. 2. Run the stub line to Aviation/Century as in C1, but with an added stop at Aviation/Imperial. This solves the backtracking problem, but adds complexity (and some cost) due to stub trains needing to reverse direction at Aviation/Imperial. At least during the first few years, before the airport connector is built, I see no compelling reason to transfer at Aviation/Century as opposed to Aviation/Imperial, so I’m surprised this option is not being discussed. Steve, are you able to find out why there is no option of ending the stub at Aviation/Imperial? Is there a technical reason why that station can’t serve as the stub terminus? Make it a real transit system serving everyone. Run the current Green Line end to end and then every other southbound Crenshaw Line goes either east or west on the Green Line to it’s respecting terminal. No transfers and thru service to all terminals. Upgrade the power system on the Green Line now, not after the two lines are connected and service disruptions on both lines avoided. This idea of the inability to run trains closure to one another was accomplished back in the P.E. and L.A. Railway days using visual operation. With the modern systems now mandated on all railroads and the high tech systems employed at the MTA for both rail and bus operations trains can run one minute apart safely. . The 105 freeway (Glenn Anderson Freeway) and the Green line down its middle were funded because of the efforts our South Bay gov. representatives to alleviate traffic at the So Bay curve and start encouraging use of mass transit from the So Bay. Now Metro is taking away the direct ride to the 2 downtown options: Silver line bus and Blue Line train. So while the “most” people might benefit in the short term if the Green Line route is mostly taken-over by the “new Crenshaw Line” – there will be longer term consequences to this taking. From past Metro behavior, the South Bay sees itself being taken advantage off when its not mostly ignored by Metro. There will come a day when Metro seeks its next tax increase to fund the next set of trains: Orange Line, Brown line, etc…? This only matters if you don’t need the 66% of the votes from the South Bay. How many of the folks entering the Metro system at Norwalk are going to be LA County voters? So maybe the most people benefit but Metro poking the South Bay in the eye again by making those voters transit to downtown another 7 minutes longer is not going to help. In a previous effort to help the most people, didn’t CalTrans eliminate 1 lane of the 405 in each direction to add a carpool lane? This delayed us and “encouraged” car pooling. The well-intentioned and naive folks thought making our commute longer would encourage us to carpool – instead they created a voter revolt that should have led to a mass transit lesson learned: Do not make commutes longer for a “greater good” goal unless you are willing to face the backlash of the voters impacted. The Crenshaw and Green lines were designed and built for their original paths and operating plans. Coming up with yet another alternative operating plan after-the-fact by running the Crenshaw line on the same tracks as the Green was not thought thru sufficiently well enough. If Metro wants to run 3-car trains on the Green line tracks – they need to provide the Green line power upgrade first. 12 minute headways on each individual route, but 6 minute headways on each actual service branch. Leave the Green Line as is. I ride it to DTLA via the Silver Line. It takes long enough already and I strongly oppose lengthening my commute. The somewhat circuitous route of the Norwalk to Expo route makes me wonder about true ridership potential. The concept of doing a Redondo/Expo route was dropped. Is there not a demand in the South Bay for this easier method to downtown? One would think this would have more of a demand than Norwalk/Redondo. However, that might create another clogged wye situation. Metro should stop using the argument that they need to operate three-car trains on the Crenshaw Line. Until the Crenshaw Corridor is extended north into West Hollywood, two-car trains will be more than enough to serve the ridership demand. The near-term operating plans for the Green and Crenshaw Lines should be based on the use of two-car trains throughout the system. If trains are running at 6-minute headways along the Crenshaw Corridor there will be no need for more than two car trains. Long term ridership forecasts for the current phase of the Crenshaw Corridor are what, 16,000 daily trips? That translates to peak hour loads of 600-700 passengers per hour. At these load levels, the average Crenshaw Line train will carry 60-80 passengers, which is approximately 50 percent of the seating capacity of a two car light rail train. Plenty of room with no crowding. By comparison, peak hour loads on the Expo Line (which also runs at 6-minute headways, but with three car trains) are approximately 1,500 passengers per hour. Expo Line trains regularly carry loads of 150-200 passengers during peak hours, which is 75-100 percent of the seating capacity of a three car train. I remember when Expo was extended to Santa Monica, and Metro only had enough light rail cars to operate two-car trains at 12-minute headways. Back then, peak hour Expo Line trains were operating at an average of 150 percent of seated capacity (and often much more), which definitely qualified as “less than ideal for a new rail line”. Until the LAX Automated People Mover opens in 2023, Alternative C3 is better than the Metro staff’s C1 because it provides for one-seat service both from Norwalk to the Expo Line and from the Blue Line to Redondo Beach. In the long run, we need to have one-seat light rail service from Torrance to Hollywood. There is a huge potential demand – largely because of the unbelievable congestion on major arterials like La Cienega, La Brea, Crenshaw and Overland. And traffic will only worsen in the ensuing decades. The staff proposal for a truncated light rail service that is little more than 3 miles from Redondo Beach to Century / Aviation is a huge middle finger for the South Bay – and is incredibly counterproductive and short-sighted for those of us who care about mass transit throughout the region. As designed, it will require a minimum of two transfers to go to desirable destinations like Downtown LA, Culver City, USC or Santa Monica – an unacceptably low level of service for offpeak travel. This may have been discussed in some of the many documents, but how does rider comfort play into this? Which station provides cross-platform transfers or the least amount of walking between trains? Which configuration has the least overcrowding, both on the lines being studied as well as the Blue and Expo Lines into Downtown LA? Rider environment should be a major criteria for choosing a configuration — both transfer difficulty and train car overcrowding. Since I don’t live on the corridor, I can’t speculate how to answer these questions. However, these should be answered before a final decision is made. It will take many years before 3 car trains on the New Crenshaw line to Norwalk are needed. Now that the Metro board voted to keep running the Green line over to the Blue Line for an additional year – metro staff is concerned that there will be Green line stops along the 105 that are “over-served”. Is this an opportunity to eliminate those over-served stops from the Green line and make it more of an Express line to the Silver and Blue lines – thus shortening the time from the So Bay to downtown and back?